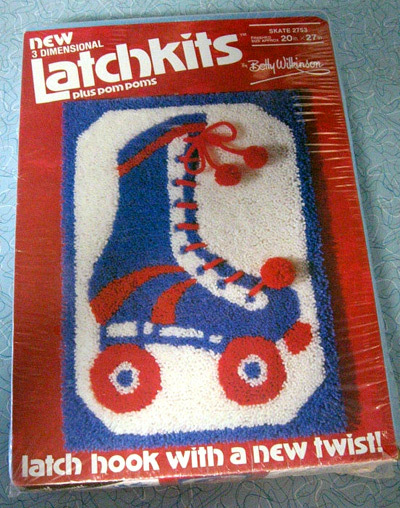 Latch hooking rugs was an awesome activity for eighties kids. The yarn craft was simple and inexpensive, yet super satisfying. With a single easy-to-master move, we made plush, colorful rug squares. 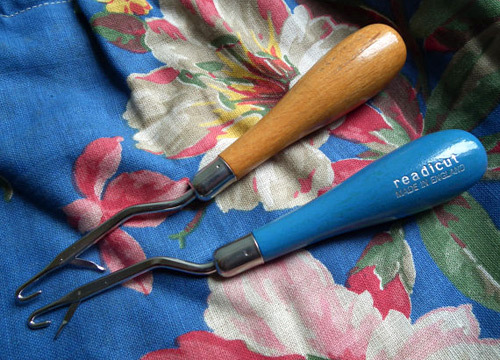 Of course, we didn’t use them as actual rugs… but they were perfect for wall hangings and pillows. 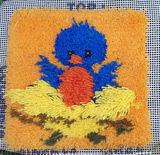 The nice thing about latch hooking was that you were pretty much guaranteed a great looking and feeling product. 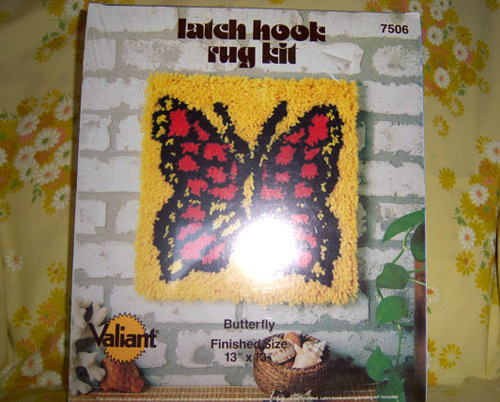 Unlike, say, paint-by-numbers kits, latch hook rugs provided reliably professional looking results. And look! 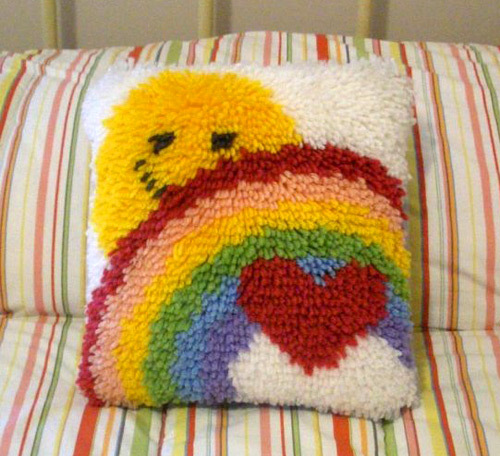 Here’s Davia’s latch hook pattern made into a cute and cheery pillow! Latch hooking was a snap. 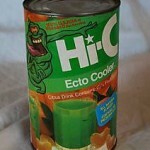 It was MUCH simpler than cross-stitching, knitting, or even making ribbon barrettes. All you had to do was follow the printed color diagram and you’d end up with a tactilely delightful work of art. 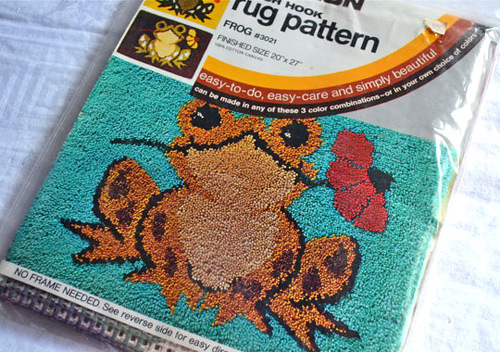 The only real obstacle to a lovely, finished latch hook rug was, like, getting bored and quitting halfway through. As I recall, my display method for my latch hook rugs was somewhat unrefined. It involved masking tape and thumbtacks. 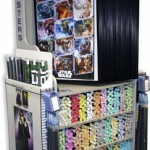 However, there are ways to complete your piece that provide a much more professional look. 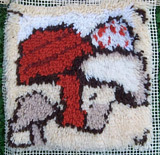 Pillow creation, it turns out, is also not that complicated and is a terrific option. Ah – sibling love, eighties style. Awesome. 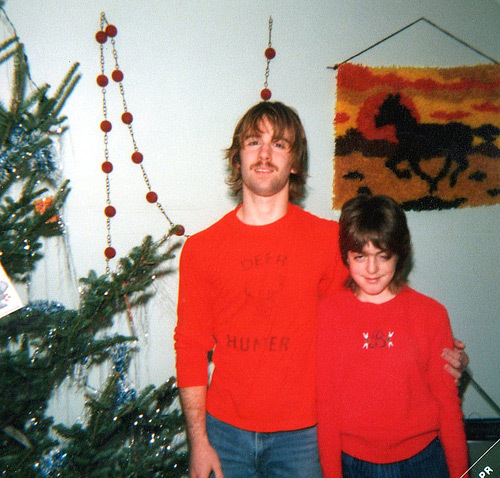 But check out the horse-at-sunset latch hook rug on the wall behind them – cool, huh? 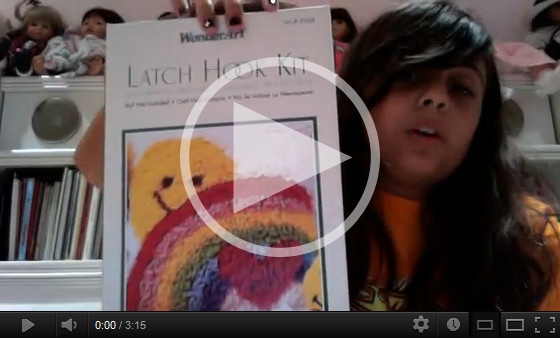 You may also need to pick up your own pre-cut latch hook yarn. New yarn is available at craft stores or you can opt for vintage yarn from Etsy. Latch hooking wasn’t a thrilling activity. It was, however, deeply gratifying for kids to make great looking and feeling craft items that they could proudly display. 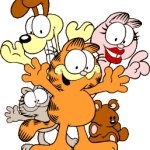 Of course, it wasn’t –and isn’t – just for children. 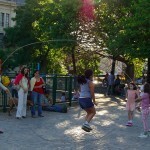 Adults and older kids enjoy the hobby, too. 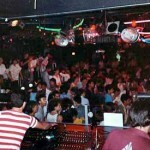 It’s experiencing a real resurgence in popularity. 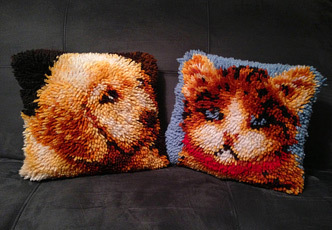 Check out Latch Hook Rugs & the People Who Make Them! on Facebook for inspiration. Creative crafters are latching with strips of fabric and yarns of varying textures and lengths. 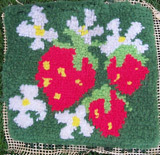 Squidoo has a great overview of latch hooking rugs here. Don’t you just love that owl hanging? I want to name it, pet it, and fluff it up, and then hang it up on the wall of my office. 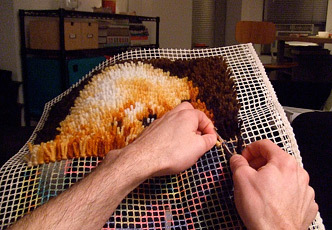 If you haven’t caught latch hook fever yet, take a peek at this bitchin’ timelapse video of a huge rug’s creation. I can just feel the crafter’s pride as she adds a little bit more each day, can’t you? 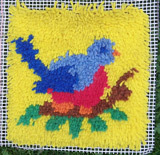 Latch hooking was an awesome craft in the eighties, and it still is today. Latch on, dudes! 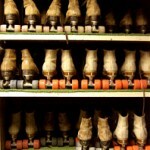 Roller Skating in the 80s!